A pair of vintage brass earrings from Glamourpuss Creations! Hi there from Lisa O'Neill of Glamourpuss Creations. I grew up in the wooded wilds of Southeastern Massachusetts but have called Boston my home for almost 15 years (yikes!). Among my faaaavorite things to do are lounging on the beach, thrift store shopping and listening to classic country music of the 50s and 60s. 2. What made you decide to begin making jewelry? When did you get started? I guess you could say I'm a life-long crafty gal. From woven pot holders and macrame as a kid, to sewing and crocheting as an adult, I've always love to make stuff. Five years ago I made some jewelry for my sister and friends for Christmas gifts and things just grew from there. 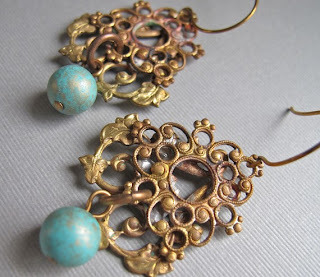 Working exclusively in vintage materials, I love finding beautifully aged brass components. The rust spots and patina that occur naturally over time are so striking. History and nature are huge inspirations. The story behind a style of chain or color of bead, the fashion trends out which they were born and the people who originally wore them are thrilling. Refashioning these pieces into modern, stylish designs for a whole new generation of women is my favorite part of making jewelry. Perhaps the best piece of advice I ever got was to be sincere and impassioned about what you do. This will translate into your creations and customers can't help but love this. This might be he hardest question! I'd have to say Butter Pecan or Pistachio, 'old lady' flavors as my husband calls them. Congratulations, Francesca! And, thanks very much to Lisa, from Glamourpuss Creations, for her generous donation and for helping to make our 12 Days of Christmas a success.